An underwater volcano has erupted and the mythical island of Atlantis is sinking! Every turn, another piece of the island sinks into the sea! Each player is in a race against time to move their Atlantean "people" to the safety of the nearby islands. But the path to safety is dangerous. Sea serpents and sharks attack your people! Whales surface and capsize your boats! 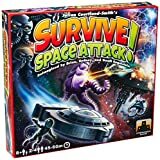 Rescue as many people as you can before the volcano tile is revealed and the game ends. The winner is the player that rescued the most points worth of people tokens. Place the 5 Sea Serpent tokens onto the 5 spaces on the game board marked with a Sea Serpent icon. 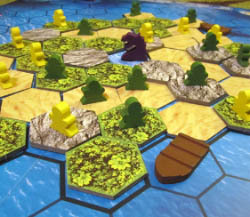 Shuffle the Land tiles face up (i.e., the Beach, Forest, and Mountain side up), and then randomly place them into the sea spaces outlined in black on the game board. You may use the Component Bag to draw Land tiles randomly. This creates the island of Beach, Forest, and Mountain tiles with a Sea Serpent on a sea space in the middle. Each player chooses a set of 10 People tokens of the same color. Each player is given 2 Boat tokens. Set aside the Shark, Whale, and remaining Boat tokens for now. Select or randomly determine a player to be the first player. Each of your People tokens has a number from 1 to 6 printed on the bottom. Review your tokens but keep the numbers secret from other players. Try to remember where you have placed them in the following steps since the higher the number, the more points each People token is worth if you successfully move it to a safe island. Starting with the first player and continuing around to that player's left, players take turns placing one People token on any unoccupied Land tile (i.e., a tile without a People token). Take care not to let the other players see the numbers on the bottom of your People tokens as you place them. Placement continues until each player has placed their 10 People tokens. When playing with less than four players, some Land tiles will be unoccupied. 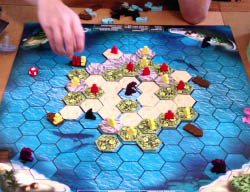 Starting with the first player and continuing around to that player's left, players take turns placing one of their Boat tokens on any unoccupied sea space (i.e., a sea space without a Boat or Sea Serpent token) next to a Land tile. Placement continues until each player has placed their two Boat tokens. Once the game has begun, you may not look at or reveal the point values of your People tokens, even if they have reached a safe island or have been removed from the game. Play a Land tile from your "hand". You may play one (and only one per turn) Land tile that you acquired during a previous turn of the game. Naturally, you will skip this step on your first turn and on any turn when you have no Land tiles in your "hand". Move your People and/or Boat tokens. You may move any combination of your People and/or Boats up to a total of three land or sea spaces. For example, move two of your People one space each into a Boat and then move that Boat one space. The goal should be to get your People into Boats and move them toward the nearby islands. See the "Moving Your People and Boats" section below for details. Remove a Land tile. You must carefully remove one Land tile from the island. Any People on the tile are placed onto the sea space where the tile had been. Carefully look at the bottom of the tile without showing it to the other players and then see the "Using the Information on a Land Tile" section below for details. There are two priorities when choosing which Land tile to remove. First, choose a Land tile that is adjacent to at least one sea space (which includes a space where another Land tile had been). The second priority is that all Beach tiles must be removed first, then all Forest tiles, and finally the Mountain tiles (because the lower lying Land tiles are sinking into the sea faster). In the event that a Beach tile is surrounded by Forest and/or Mountain tiles, remove it as the last Beach tile (since it is not adjacent to a sea space). The same applies if a Forest tile is surrounded by Mountain tiles. Roll the die and move a creature. You must roll the Creature die. Then you may move one Creature (Sea Serpent, Shark, or Whale) matching the result of the die roll (if it is already on the game board) in order to attack another player or to protect your own People. See the "Using the Roll of the Die" section below for details. from any Land tile to an adjacent Land tile even if it is occupied by one or more other People tokens. from a Land tile onto a Boat if the Boat is in an adjacent sea space. from one Boat to another Boat in an adjacent sea space. into a Boat that is already occupied by People of another color. You may not move another player's People token. Once a People token leaves the island (by moving to a Boat or by becoming a Swimmer), it cannot return to a Land tile. People tokens become Swimmers by moving into a sea space from an adjacent Land tile, by jumping overboard from a Boat into the same sea space, by falling into a sea space when a Land tile is removed, or by falling into a sea space when the Boat that they occupy is capsized by a Whale. You may move a Swimmer only one sea space on your turn. Moving from a Land tile or Boat into a sea space counts as one move by a Swimmer. You may move a Swimmer onto a Boat only if they occupy the same sea space. More than one Swimmer may occupy the same sea space. If you move a Swimmer into a sea space containing a Sea Serpent or Shark, the Swimmer is immediately removed from the game (i.e., you can't attempt to move through such a sea space). Any player may move any unoccupied Boat from sea space to sea space as desired. No more than one Boat may occupy a sea space at a time. 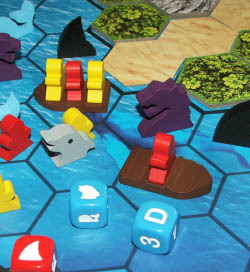 Each Boat can only carry a maximum of three People tokens at a time (regardless of which players control the People tokens). If People from multiple players are aboard a Boat, the player with the majority of People on board controls the Boat. When you control a Boat, only you can move it. 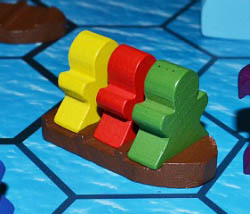 Whenever players control an equal number of People aboard a Boat, each player controls the Boat. If you move an occupied Boat into a sea space containing a Sea Serpent, the Boat and the People aboard are immediately removed from the game (i.e., you can't attempt to move through such a sea space). If you move an occupied Boat into a sea space containing a Whale, the Boat is immediately removed from the game and People aboard become Swimmers (i.e., you can't attempt to move through such a sea space). If the sea space also contains a Shark, the Swimmers are removed from the game. People can disembark from a Boat that is in one of the two sea spaces adjacent to one of the safe islands. Each People token moved from the Boat to a safe island counts as one move. The Boat remains in the same sea space until moved again. Moving a Swimmer onto a safe island from an adjacent sea space counts as one move. Take a Shark token that was set aside and place it in the sea space where the Land tile had been. Any Swimmers in that sea space are removed from the game. Take a Whale token that was set aside and place it in the sea space where the Land tile had been. Take a Boat token that was set aside and place it in the sea space where the Land tile had been. If there are any Swimmers in that sea space, place them on board the Boat. If the sea space has more than three Swimmers, the player that revealed the Land tile chooses the three Swimmers to place on board the Boat. Remove all Swimmers, Sea Serpents, Sharks, Whales, Boats, and People in the sea space where the Land tile had been and in any adjacent sea spaces from the game. A dolphin aids one of your Swimmers! Move one of your Swimmers up to 3 sea spaces. You get favorable winds! Move one of the Boats you control up to 3 sea spaces. Move any one Sea Serpent on the game board to any unoccupied sea space. 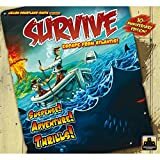 Move any one Shark on the game board to any unoccupied sea space. Move any one Whale on the game board to any unoccupied sea space. Finally, if you see one of these symbols, place the tile face down in front of you (into your "hand" of tiles). These tiles are played outside of your turn (and only on another player's turn). These tiles are considered "defensive" tiles, as they are played in response to the movement of a creature that is made by another player. When another player moves a Shark into a sea space occupied by one of your Swimmers, you may play this Land tile to remove the Shark from the game (before your Swimmer would be removed from the game by the Shark). Leave your Swimmer in the sea space. When another player moves a Whale into a sea space occupied by a Boat that you control, you may play this Land tile to remove the Whale from the game (before the Whale capsizes the Boat). Leave the Boat in the sea space. If you roll a Sea Serpent, move any one of them one sea space. If there is an occupied Boat in the sea space, remove it and the People aboard from the game. Also remove all Swimmers from the sea space. An unoccupied Boat is not removed from the sea space. If you roll a Shark, move any one of them one or two sea spaces. If the first sea space entered is occupied by one or more Swimmers, the Shark's move ends. Remove all Swimmers from the sea space where the Shark ends its move. A Shark does not affect a Boat in the same sea space. If you roll a Whale, move any one of them no more than three sea spaces. If the Whale enters a sea space that contains an occupied Boat, the Whale's move ends. 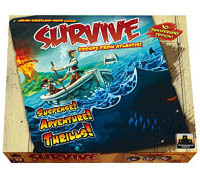 If there is an occupied Boat in the sea space where the Whale ends its move, remove the Boat from the game and the People aboard become Swimmers. If the sea space also contains a Shark, the Swimmers are then removed from the game. A Whale does not affect Swimmers or an unoccupied Boat in the same sea space. Sea Serpents, Sharks, and Whales do not affect each other. They can occupy the same sea space. One of the Mountain tiles has a picture of a volcano on the underside. 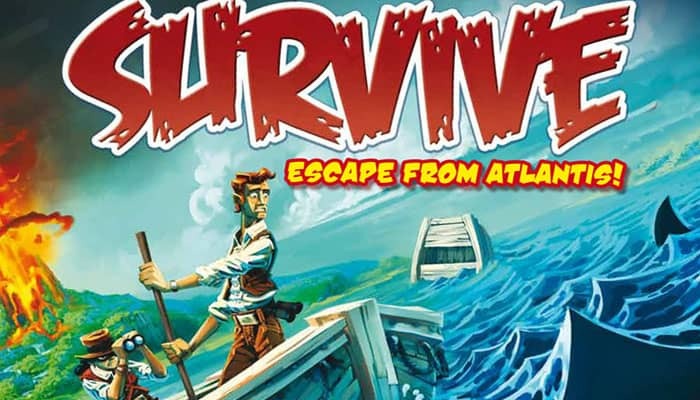 As soon as a player reveals this tile, an erupting volcano destroys what is left of Atlantis as well as the People still moving toward the safe islands. The game is now over. It is possible that you may not have any People left to move prior to the game ending. If this happens, continue playing except do not perform step 2 under "Game Play" above (Move your People and/or Boat tokens) during your turns. When the game ends, turn over all the People you have landed on the safe islands and add up the numbers on the bottom. The player with the most points (not necessarily the most People) wins the game.